Following a one-win, two-loss week, the Terriers fell to #3 in both polls. 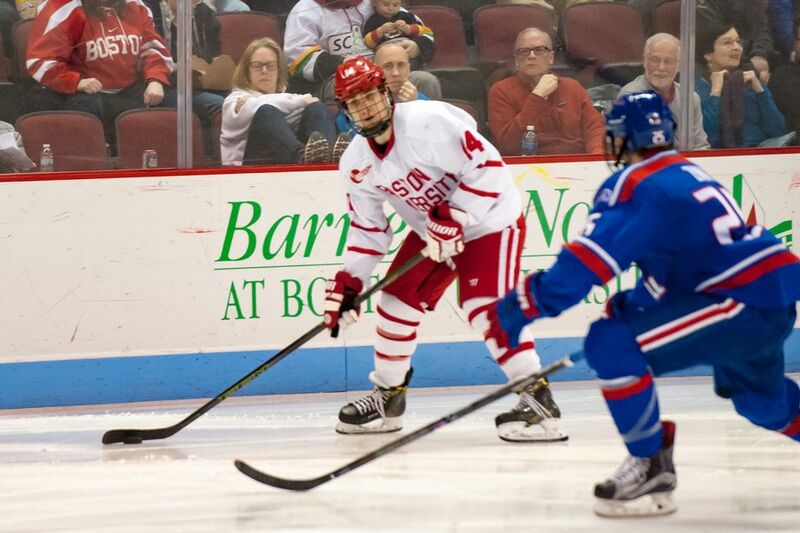 BU had been #1 in the USCHO poll and #2 in the USA Today/USA Hockey Magazine poll. BU remains at #3 in the PairWise rankings. Sophomore Bobo Carpenter and freshman Clayton Keller were named to Hockey East’s weekly list of top performers. 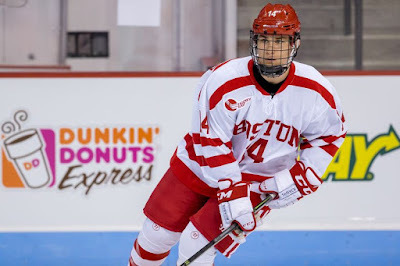 ● Boston Hockey Blog: Comments from Doyle Somerby and Nick Roberto at the Beanpot luncheon. Max Prawdzik stopped 12 of 13 shots in NAHL Lone Star's 4-1 win against Topeka. The 6'3" netminder from Andover, Massachusetts, who is taking the semester off, improved his record to a perfect 4-0 with a 2.24 goals against average. 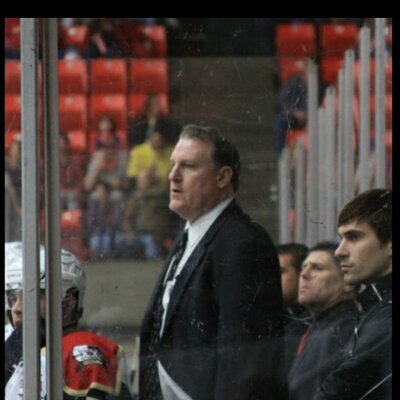 2017 recruits Logan Cockerill and Brady Tkachuk each scored twice in the NTDP U18s’ 7-3 win against Bloomington. Cockerill also recorded an assist and fellow recruit David Farrance added a pair of helpers. Tkachuk is tied for the team lead with 32 points (14G, 18A). Cockerill has 21 points (12G, 9A) and Farrance, with 23 points, is the top scoring blueliner. 2017 recruit Shane Bowers scored his 14th goal in Waterloo’s 4-2 win against Sioux City. Bowers, who has 30 points in 38 games for the Black Hawks, was named USHL Forward of the Week after a five point (3G, 2A) weekend. 2018 recruit Joel Farabee tallied his 17th goal in the U17s’ 4-2 win against Sioux Falls. The forward from Cicero, NY leads the team with 29 points. Danny O'Regan, AJ Greer, Chris Bourque and David Warsofsky were participants in the AHL All-Star Classic with Clark Donatelli (photo) behind the bench of the Atlantic Division team. In Sunday’s skills competition, AJ Greer finished second in the hardest shot competition, while Danny O’Regan finished second in the fastest skater competition. On Monday night, O'Regan and Greer scored the first two goals for Team Pacific in their loss to Team North. With 37 points, O'Regan is the top scorer for the San Jose Barracuda and second in scoring among AHL rookies. 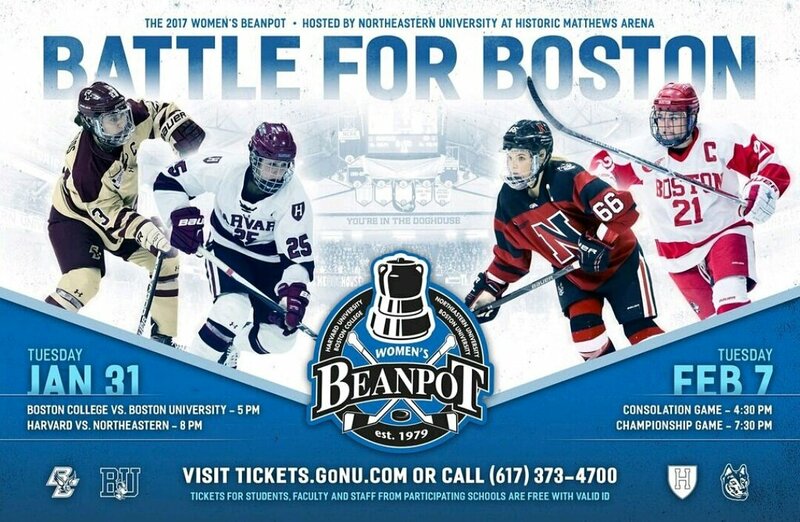 The Women’s Beanpot Tournament begins today with the Terriers taking on #6 BC at Matthews Arena. 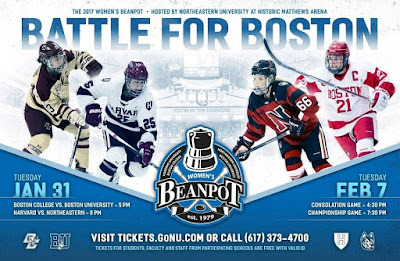 Harvard and Northeastern meet in the nightcap. 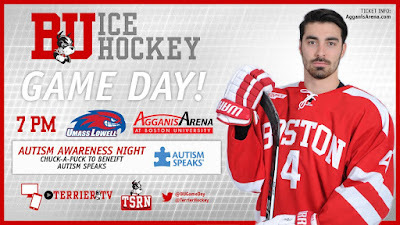 Gametime for BU and BC is 5 p.m. and both contests will be live streamed on GONUxstream. The Terriers and Eagles have met three times this season with each team winning at home in November by a 5-3 score and then skating to a 1-1 tie at Conte Forum in January. 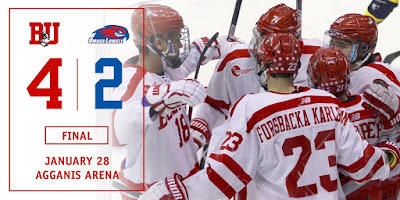 The River Hawks got on the board first with a power play goal by Ryan Lohin at 8:36, but it didn’t take long for BU to respond. Just one minute later, Gabe Chabot grabbed a loose puck at center ice, broke in on a 2-on-1 on Tyler Wall and wristed a shot from the right faceoff dot past the goalie, stick side. Second period was scoreless with both teams creating numerous scoring chances. Oettinger came up big on several Lowell grade-A chances, including a John Edwardh breakaway and a 3-on-1 shot by CJ Smith, to keep the game tied at 1-1. Midway through the third period, Keller fed Carpenter from behind the Lowell cage and Bobo rapped it home, with Jordan Greenway also assisting. Less than three minutes later, Carpenter sent a long pass to Keller, who broke in and beat Wall with a backhander, high to the glove side, for what would be the game-winning goal. At the 17-minute mark, Smith scored an unassisted goal, beating Oettinger with a backhander, cutting the margin to one. BU would have to weather one more Riverhawk power play. Then with Wall pulled, Carpenter intercepted a clearing attempt just inside the blue line and found the empty net. Keller, who took over the team scoring lead with 26 points, extended his point-scoring streak to 12 games. He’s been held off the scoring sheet in just two of his 18 starts. 2018 recruit Jake Wise scored a power play goal and Tyler Weiss had a slick assist in the NTDP U17s’ 4-3 loss to Tri-City. Wise, who has 21 points, had given the U17s a 3-2 lead when he one-timed a shot from the top of the right circle. 2020 recruit Trevor Zegras scored his ninth and tenth goals and added an assist in Avon Old Farms’ 4-0 win over Loomis-Chaffee. The sophomore wing leads AOF with 25 points in 16 games. 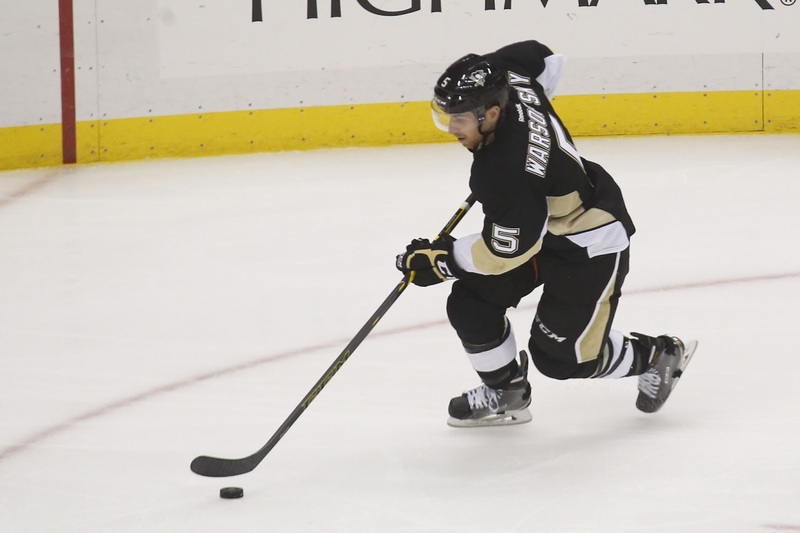 David Warsofsky assisted on two goals in Wilkes Barre/Scranton's 6-2 win against Binghamton. With 33 points in 30 games, he’s the top scoring blueliner on the Baby Pens. 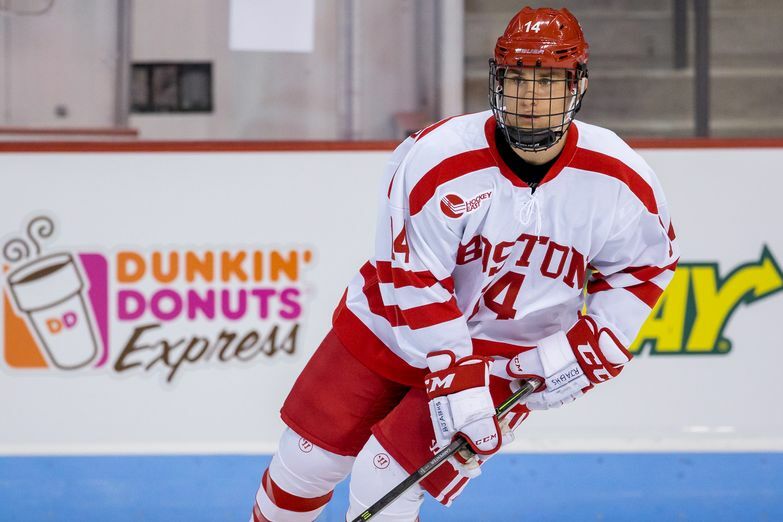 Former BU assistant captain Cason Hohmann has been traded to the ECHL Indy Fuel. He had 10 goals and 10 assists in 24 previous ECHL games this season. Terriers dropped a 4-1 decision to Merrimack at Lawler Rink. Victoria Bach scored BU’s only goal to tie the score at one apiece, but the Warriors scored the next three tallies.